Pinnacle Koto is a kiddie bike model that is far more affordable than the brand’s Aspen bikes. These bikes are lightweight and very simple to ride thanks to a single gear. All around alloy parts keep the weight down. The bikes also come in a range of gender neutral colors. 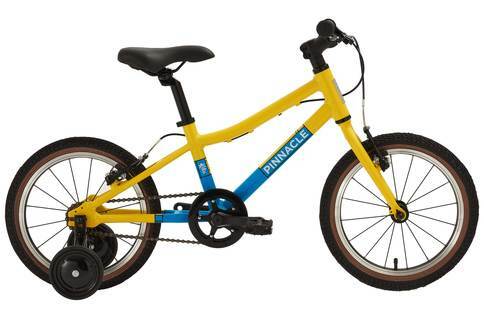 Pinnacle Koto is a kids bike model from the noted brand. Pinnacle offers several highly desirable kiddie bike models, and Koto is the best suited for older kids in the 7 to 10 age range. These bikes are intended for all-round use for learning and leisure riding. The bikes are definitely designed with fun in mind. If you have a reluctant little cyclist at home, this bike would be a good option the get the child to like cycling. We had several budding cyclists review this model for us. The Koto bikes are made with butted aluminum frames. These bikes have the same wheels as the Aspen model, which is more expensive. The main advantage of the wheels is that they have large air chambers to make riding easy for inexperienced cyclists. The designing is simplified and has only a single 32×17 gear. It keeps riding simple. Overall, the weight is kept down. This model is really lightweight, which our reviewers didn’t fail to notice. These bikes are a great upgrade over traditionally steel bike for kids, which are heavy. The bikes come in an array of colors too. The colors are gender neutral like white and yellow, so parents can avoid stereotypical girl or buy colors. The bikes are also small in size, which makes them easy for parents to guide and carry around. Components, including hubs, cranks, and headsets are made from really durable material. So the bikes can definitely be kept around to hand down to a younger sibling. While the bikes are great overall, we thought they could have done better with the brakes. Pinnacle Koto is a simple and lightweight bike model that makes cycling fun for little riders. These bikes are not as expensive as the brand’s Aspen kiddie bike range, which is a big plus. Both parents and kids alike can appreciate the thoughts that have gone into the design of this model.